I like the unusual framing, with the object at the top being cut off by the top edge of the frame. There’s an odd tension created by the sense of depth/flatness. At the bottom of the frame the image looks almost flat, but the top gives a sense of perspective. An intriguing image! It is the important element for photography that the meaning of word is inverted by our sensitive work. I seem that the framing is one of the way which can make it effectively. I think about this work that the rock floating on the sea was became a important object for the balance point on the frame by cutting off the top. I think I understand what you’re trying to say, and I think that it works in this image. 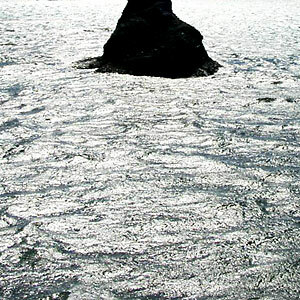 There is a contrast between the dark object at the top of the frame and the light area at the bottom (created by the light reflecting off the sea). This contrast keeps my eyes moving up and down the surface of the image. When I see it on a web page it’s hard to make out the details, so it appears more abstract. Perhaps this enhances the balance between the small dark area and the larger, light area. That looks like a satellite-picture from another planet with clouds and a huge, over-dimensioned mountain…i really like ur works.